Coach Zac Taylor said he'll see what Ross can put on tape, noting that the 24-year-old wide receiver was "electric" in college, Geoff Hobson of the Bengals' official site reports. Bengals executive Duke Tobin said the team hasn't engaged in any internal or external discussions about trading Ross, Geoff Hobson of the team's official site reports. 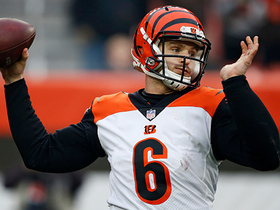 The Bengals are looking to trade Ross, Ian Rapoport of NFL Network reports. 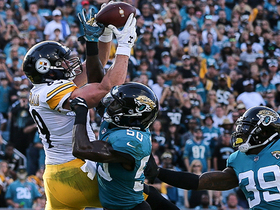 Ross was held to one catch for one yard on five targets in Sunday's loss to the Steelers. He finishes the season with 21 catches for 210 yards. albeit with seven touchdowns. Analysis: Though he's dealing with the noodle arm of Jeff Driskel, Ross isn't blame-free for his poor catch ratio. In fact, Ross has the lowest catch percentage among qualified receivers for the season at 36.21 percent. Given how much time he's missed due to injury so far as a pro, some patience is warranted with Ross, but his Year 3 season in 2019 will be critical. Ross only corralled one of his five targets during Sunday's 26-18 loss to Cleveland, but that reception went for a three-yard touchdown. He added seven rushing yards on one carry. Ross (knee) practiced fully Friday and doesn't carry an injury designation into Sunday's game against the Browns. Ross (knee) was a limited participant in Thursday's practice, Jay Morrison of The Athletic reports. Ross was a limited practice participant Wednesday due to an ankle issue, Paul Dehner Jr. of The Cincinnati Enquirer reports. 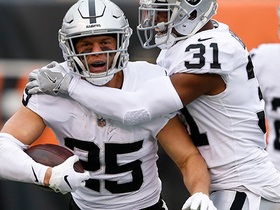 Ross caught one of five targets for six yards during Sunday's 30-14 win over the Raiders. Analysis: Despite facing a favorable matchup and teammate Tyler Boyd's early exit with a knee injury, Ross posted his worst yardage output since the first week of the season. Already a streaky player, Ross is plunging to new lows with Jeff Driskel under center, as the pair has connected just five times for 30 combined yards over the last three games. The second-year speedster will look to get back on track against the Browns next Sunday. Ross corralled two of four targets, compiling 11 receiving yards and one touchdown during Sunday's 26-21 loss to the Chargers. Ross caught two of three targets for 13 yards and added a 2-yard run during Sunday's 24-10 loss to Denver. Ross caught three of seven targets for 31 yards and a touchdown in Sunday's 35-20 loss to Cleveland. Analysis: Ross extended his touchdown streak to three games on a two-yard score late in the first half. That was the only touchdown quarterback Andy Dalton threw before exiting the contest due to a thumb injury. With Dalton's status in question and the possibility of A.J. Green (toe) making his return and bumping Ross out of two-receiver sets, stretching his touchdown streak to four games won't be easy for the 2017 first-rounder against the Broncos in Week 13. Ross caught two of seven targets for 27 yards and a touchdown during Sunday's 24-21 loss to Baltimore. Ross (groin) is active Sunday against the Ravens. Ross (groin), who is listed as questionable for Sunday's game against the Ravens, is expected to play, a source told Ian Rapoport of NFL Network. Ross (groin) is listed as questionable for Sunday's game against the Ravens, Paul Dehner Jr. of The Cincinnati Enquirer reports. Ross (groin) was limited at practice Wednesday, Paul Dehner Jr. of The Cincinnati Enquirer reports. 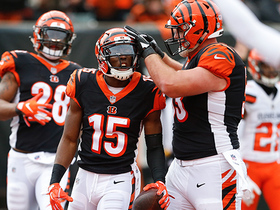 Ross caught a touchdown pass on the Bengals' first drive of the day Sunday against the Saints, but overall was held to two catches for 39 yards in a losing effort. 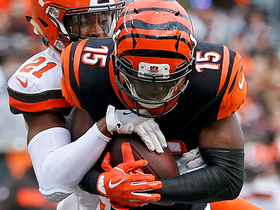 Analysis: Ross led the Bengals with six targets, including one that resulted in a fateful interception in the two-minute drill in the second quarter. That pick was brought back deep into Bengals territory and led to a Saints touchdown right before halftime. Ross could be a frequent target the next few games with A.J. Green (toe) possibly out until December. Ross (groin) practiced fully Wednesday, Paul Dehner Jr. of The Cincinnati Enquirer reports. Analysis: Ross, who has missed three of the last four games, is poised to return to action Sunday against the Saints. The timing couldn't be better for the second-year wideout, as top target A.J. Green is sidelined by a toe injury for at least one week. In the meantime, Tyler Boyd profiles as the Bengals' No. 1 wide receiver, but the absence of Green provides the speedy Ross with a clear opportunity to make his biggest splash as a pro since being taken with the No. 9 overall pick in the 2017 NFL Draft. Analysis: Ross was held out of practice leading up to an absence for Week 8 against Tampa Bay, but he seems to have made progress coming out of a Week 9 bye. With A.J. 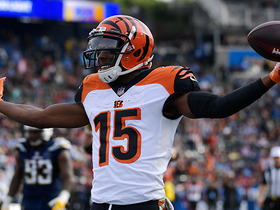 Green (toe) looking doubtful to play in Sunday's game against New Orleans, the Bengals may have little choice but to make Ross a key part of the game plan in a highly favorable matchup. Check out the fantasy performances that helped no one in Week 16. Oakland Raiders safety Erik Harris reads Cincinnati Bengals quarterback Jeff Driskel's deep pass for an interception. Cincinnati Bengals quarterback Jeff Driskel connects with his wide receiver John Ross for a 6-yard touchdown. 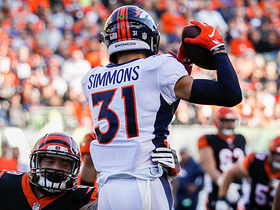 Denver Broncos safety Justin Simmons intercepts Cincinnati Bengals quarterback Jeff Driskel. Cincinnati Bengals quarterback Andy Dalton throws a dime to wide receiver John Ross for a 17-yard gain. 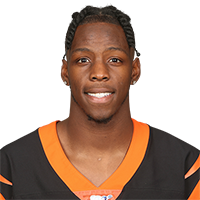 Cincinnati Bengals quarterback Andy Dalton finds wide receiver John Ross for a 2-yard touchdown. 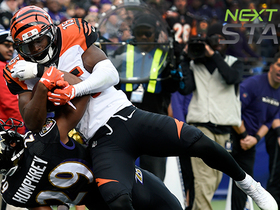 Next Gen Stats looks at the completion probability for Cincinnati Bengals wide receiver John Ross' touchdown catch against the Baltimore Ravens in Week 11 of the 2018 NFL season. 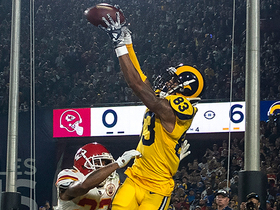 Check out the most acrobatic catches and interceptions of Week 11 during the 2018 NFL season.